If you are like me, you spend a lot of time doing laundry. It seems my washing machine is constantly running. It’s pretty simple to green your laundry. 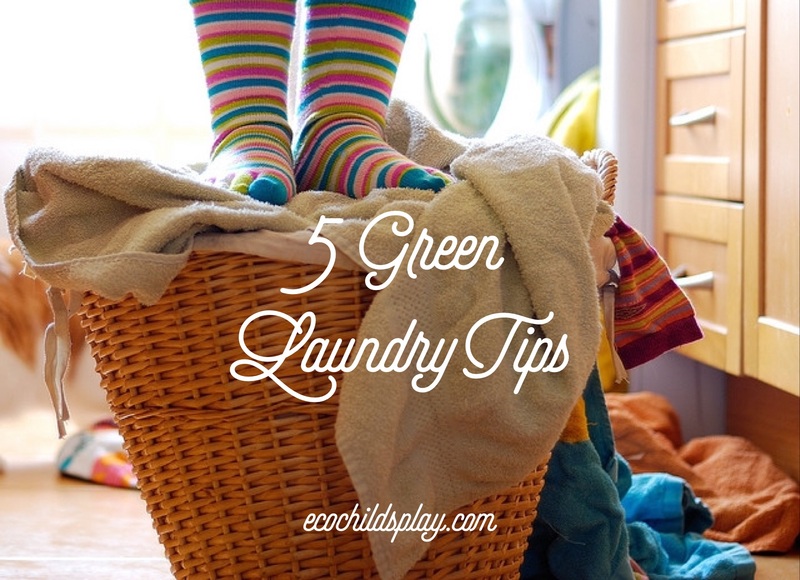 Follow these 5 green laundry tips! There are a lot of environmentally-friendly laundry soaps in both liquid and powdered form available now. Retailers, such as Whole Foods, use an eco-scale rating to help customers decide which product is right for them. We were sent Roux Maison essential laundry detergent, stain remover, and delicate laundry detergent to try. Why choose us? It’s simple, Roux Maison is just better, no harmful chemicals, no gunk! As a parent, you gotta love that it’s so safe you can even use your finger to apply and spot treat stains. But there’s more: When combined with Roux Maison’s Laundry Detergents, our Stain Remover helps get your clothes cleaner than the current market leader! Best of all, it’s hypoallergenic – this means no more buying specific, expensive baby stain removers. Cleaner: Most mainstream stain removers use damaging chemicals that leave a residue that coats your fabrics and diminishes the life of your clothes. Our products rinse clean so there is nothing left but clean! Healthier: So safe you can use it on baby’s clothes (and pet beds) and apply or spot treat with your finger! The hypoallergenic quality makes this the perfect alternative for those with sensitive skin or allergies. Safer: No harsh chemicals (Paraben, Phthalate, Phosphate, and Preservative-Free) and all our bottles are BPA-free! Roux Maison’s Stain Remover is the perfect complement for all your laundry needs. It works great by itself and provides optimal outcomes when used together with your favorite Roux Maison Laundry Detergents. I love how concentrated these products are, as well as their effectiveness. I also love how they do not leave a lingering odor. It used to be natural laundry soaps had a bad rap for not being effective. I remember my environmental science professor saying he just didn’t care if his whites were white. The earth was more important! I agree, but we no longer needed to make such choices. Natural laundry detergents are effective! I really hate the smell of chemical laundry detergents. It gives me a headache and is so persistent! I only use cold water to wash our clothes. In fact, for many years we just didn’t even have the hot water hooked up. Not only does washing your clothes in cold water only green your laundry through energy conservation, it also will preserve the life of your clothes. Clothes washed in cold water last longer and colors fade less. I wish every washing machine by default washed in cold water. It’s bothersome to press a button several times to get to the cold setting. I think we would save a lot of energy if machines were automatically set to cold when turned on. 95% of homes in Italy do not have clothes dryers. In the summer months, all of our wash is hung to dry. We save a lot of energy this way, and our clothes always smell fresh. In the rainy winter months, this is a bit more challenging. We do keep a drying rack by the woodstove, but I can’t keep up with all of our wash by using racks in the winter. In European countries, clothes dryers are uncommon no matter the season. I have stayed at a bed and breakfast in Italy where there were no dryers. Sheets were hung up after every guest. I was impressed! Most western European countries, in fact, have tumble dryer ownership rates below 50%. 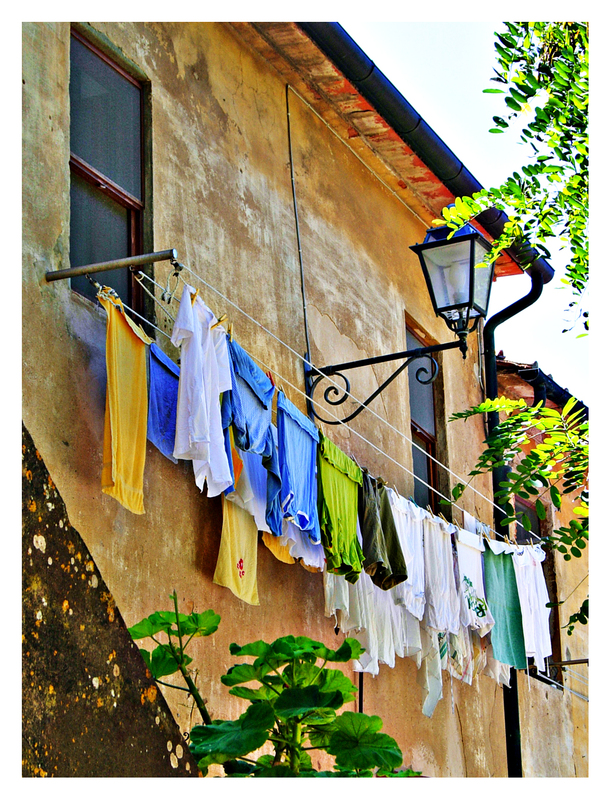 The most ambitious case of line drying on the continent is Italy, where clotheslines are famously ubiquitous and 95% of homes reportedly live without dryers. It is true that many communities have rules and regulations about outdoor clothes drying. These rules can be changed by active citizens. Growing up, my best friend’s family did not own a dryer. We lived in one of those communities with ordinances against hanging laundry outside in view of neighbors. Her family’s basement was crisscrossed with laundry lines. Hanging laundry takes more time, but I enjoy it. The time outside in the sunshine can be a reflective time. This green laundry tip is probably not much of a problem for you if you have children. My loads are always full! Even if you run the machine with small load settings, the machine is still using most of the water and most of the energy of a full load. Let’s look at some actual numbers. A typical household can save 3,400 gallons of water a year by running full laundry loads instead of half loads, according to the U.S. Department of Energy. Given a national average of $1.50 per 1,000 gallons of water, that’s an annual savings of $5.15 from just the water in the washing machine over the course of a year. Fortunately, modern machines are water and energy efficient than their predecessors. When your old machine dies, look for the most energy and water conserving model to replace it. The Energy Star label is one easy way to compare machines. Use less energy. On average, a new ENERGY STAR certified clothes washer uses 280 KWh of electricity and can save you $40 a year on your utility bills compared to a standard model. Wow, that’s a lot of vehicles! 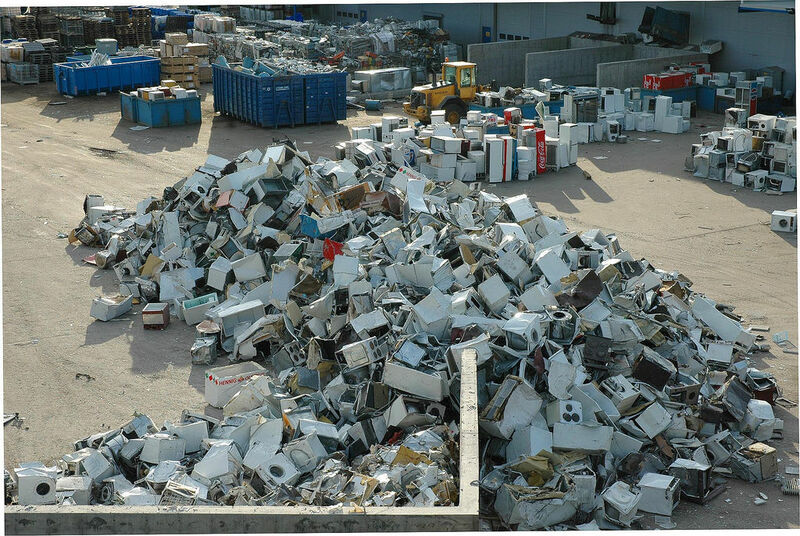 The production of new appliances also uses energy and resources. Upgrading to a new machine should be carefully considered. If your machine is still working properly, even if ten-years-old, it may be greener to wait. Thanks for sharing this information about going green with laundry tips. These can even be used if you use a laundromat to wash your clothes. I love that there is a greener way to every day tasks! I love being eco-friendly, and try to do what I can. These tips are great – I will be putting them into practive, thanks for sharing! We always try to wash our clothes in cold water because it saves money on the utility bill, and it prevents clothes from shrinking. I’m glad to see that it’s eco-friendly as well! Thanks for sharing! I had no idea that clothes dryers were in the top three things using the most amounts of energy. I can see why air drying your clothes might help save on energy. However, I did this for a couple years and my clothes always felt crusty after they were dried. If you can get used to that feeling, then this could definitely help you save money.